Transmitted to the Commissioner for his information and in compliance with Circular Letter No. 458. Newspaper clipping attached. Forms 157 covering the destruction of 600# to be submitted. In reply to your directive marked ‘Urgent’ dated August 23, 1938, concerning the clipping from the Detroit Free Press, relative to the suicide of Henry Bennett, 65 years old of Adrian, Michigan, in which it was suspected by deputy sheriffs of Lehawee County, Michigan that Bennett’s suicide may have been the result of smoking marihuana, the following facts were ascertained as a result of an investigation conducted today. 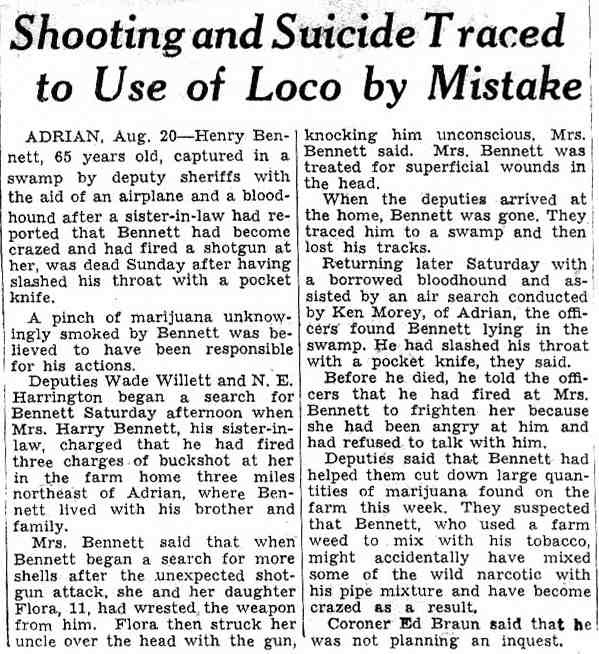 Several days previous to the date of Bennett’s suicide, officers from the Lenawee County Sheriff’s office seized approximately 600 pounds of growing marihuana on the farm owned by a Mr. Arthur Brechel, Route 3, Adrian, Michigan. The farm had been abandoned for a number of years and the marihuana had not been cultivated. Mr. Author Bennett, the suicide, resided on this farm in a shack with his brother Edward H. Bennett and his wife. 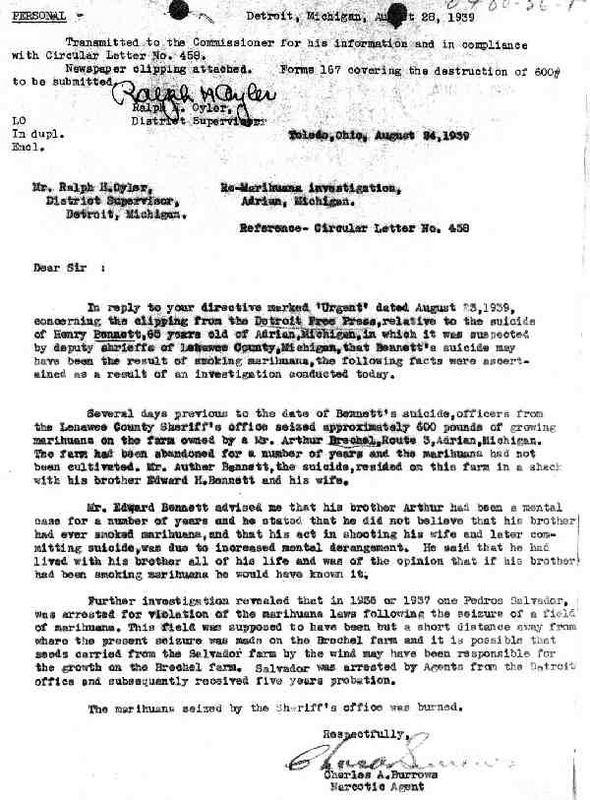 Mr. Edward Bennett advised me that his brother Arthur had been a mental case for a number of years and he stated that he did not believe that his brother had ever smoked marihuana, and that his act in shooting his wife and later committing suicide, was due to increased mental derangement. He said that he had lived with his brother all of his life and was of the opinion that if his brother had been smoking marihuana he would have known it. Further investigation revealed that in 1936 or 1937 one Pedros Salvador, was arrested for violation of the marihuana laws following the seizure of a field of marihuana. This field was supposed to have been but a short distance away from where the present seizure was made on the Brechel farm and it is possible that seeds carried from the Salvador farm by the wind may have been responsible for the growth on the Brechel farm. Salvador was arrested by Agents from the Detroit office and subsequently received five years probation. The marihuana seized by the Sheriff’s office was burned.